Moms lives are busy and crazy. I say anything that makes life a little easier and provides a shortcut: I’m all ears. 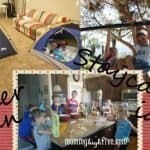 There are so many fun and tips and tricks that moms do that make the simple everyday things easier. I love the tried and true kind. They save time, money, and truly are just plain convenient. I love cleaning with this one, and it is the best shower glass cleaner hands down. 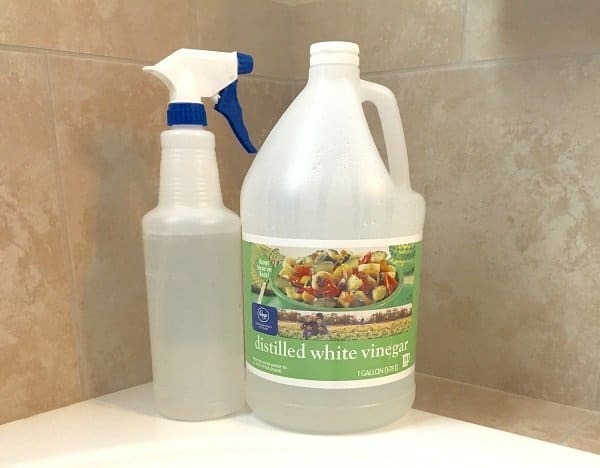 Buy a cheap cleaning spray bottle, found in the household cleaning supplies section, and a gallon of white vinegar. Mix half and half water and vinegar. Then spray on the shower glass doors and let it sit for a minute. You can rub it off with a towel, and it gets the hard water spots off right away. Yes, it does smell strongly of vinegar, but it leaves quickly and the best part is that it’s non-toxic! Mainstream tile and shower cleaners are fierce at cleaning, but I hate breathing them in. This is great for the shower tile, glass, sinks, and overall cleaning. It’s cheap, easy, and a mama homemade cleaner. Don’t worry, the fish and chips dinner smell goes away after a few minutes. Enjoy! Having the kids home all summer is all things fun and crazy. It’s so nice to not be up and packing lunches while rushing the kids out the door, but also crazy having them run around making extra messes all day, too. 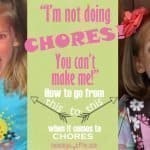 I definitely believe doing chores are important to teach kids while they are little. During the school year, however, it can be hard for us to stay on top of doing them. 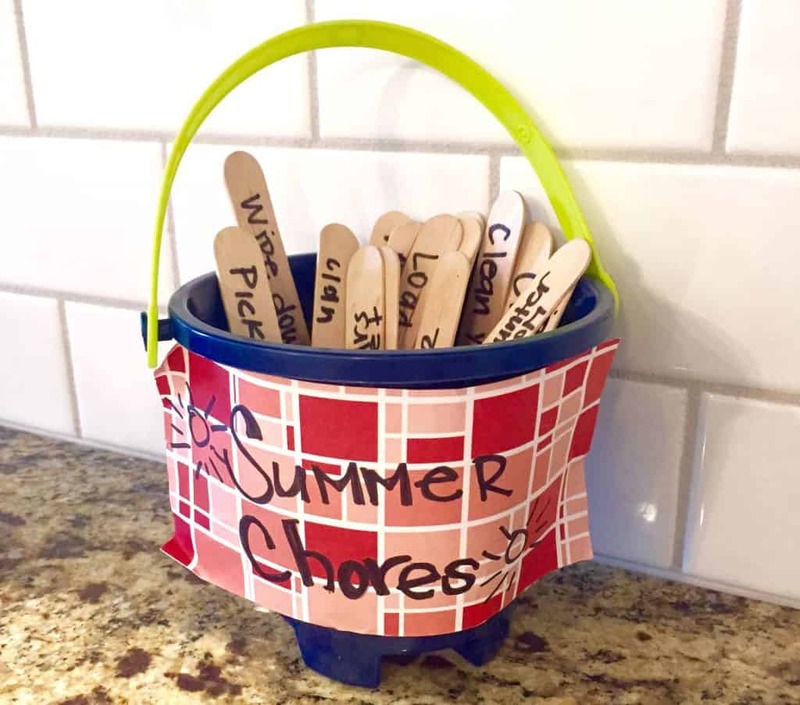 So, my kids know when summer comes around we bring out our homemade summer chore bucket. They pick one stick and they have to do it before they can play. It has really worked in our house. We bought popsicle sticks in the craft section in Wal-Mart and had the kids help and even write chores on the sticks. 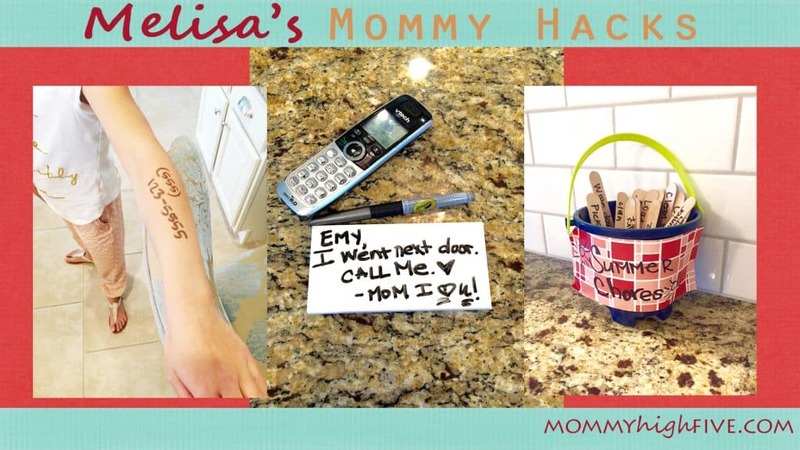 I wrote mine too, and it’s really good to write “Mom’s pick” on a few too. We bought a cute little sand pail in the dollar section at Target and with spare craft paper wrote “Summer Chore Bucket” on the outside. It’s easy, fun, and stress-free. I keep the chores easy and not too long. Some of ours are: clean kitchen counter tops, clean the bathroom sinks and mirror, Windex sliding glass door, pick up play room, and anything that you would love them to help with around the house. 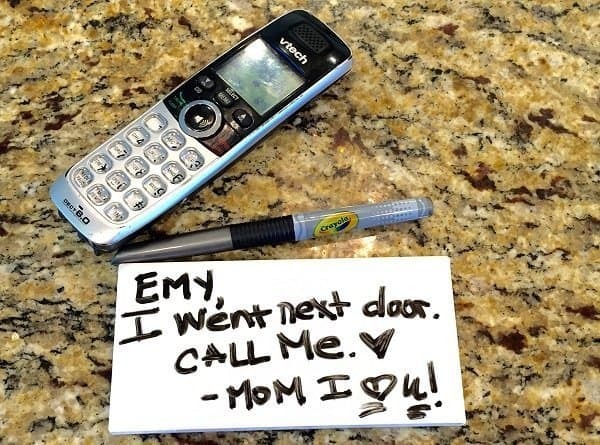 I used to have a cute whiteboard stand that I would leave notes to my big kids on. But it broke, so I came up with this mommy hack. We did our kitchen backsplash with white subway tile, and I have a lot extra. I use the tile to write quick notes to the kids, usually, “I’m next door, call me” or something like that. I leave the home phone right there and they give me a call. If I’m not home when they come in then they look for the Subway tile for any note I leave. Also, it’s cute to put in their bathroom and leave a little positive note or I love you on it. The best part is it’s free and we can use it over and over again. It’s summer and there are lots of fun activities with big crowds. When you have a little one that stays in a wrap or stroller it is not as hard to keep an eye on them. But what happens when they are at that age that they must walk and there is no way they are staying in the stroller? Things get a little busier. My sister and friend would always have a sharpie marker in their purse or diaper bag, and I got this idea from them. 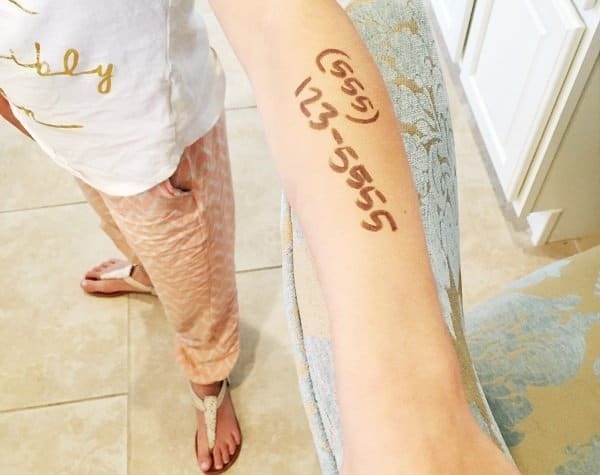 Right when you get to a big carnival, amusement park, rodeo, park, busy work party, farm, or anywhere, simply write your cell phone number on your their arm or hand. In the rare chance they wander off or get lost, there is your cell phone that someone could call you right away and let you know they have found your child. It gives peace of mind to you right away too, knowing they have that on their arm. Its quick and easy, and all you need is a marker. It will come off with a few scrubs of a baby wipe when you’re done. There are truly so many!! I love hearing everyone’s favorite mommy hacks that leave you saying, “Why didn’t I think of that?” Pinterest has plenty to thumb through, but I love hearing from my friends about what they really do to make mama’s life faster, easier, and cheaper. 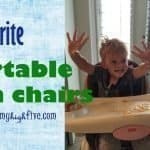 I’d love to know yours and do another article of lots of tried and true mommy hacks that help you. I will even highlight a few! Let me know and in the meantime … Happy hacking!